As a mom of twins, you already know that although your two little ones may have been born at the same time, they are very much their own people and will develop at their own pace. When you set out on potty training your twins you need to treat each of them as individuals and recognize that they may start showing signs of readiness at different times. But, there’s no reason why your twins can’t encourage each other and have some fun twin time on the potty. Here are some tips to get your twins started on their potty training journey. Buy a potty seat for each twin. Let your twins customize their potty seat with stickers to make it special. You can even personalize each one by writing their names on the base of the potty in waterproof marker. Before bath time, sit your twins on their potties while the tub fills and let them pick a special toy to celebrate when they go. Keep potties in the playroom. Twins often have so much fun playing together that it can be hard for them to make it to the bathroom when they finally realize they have to go RIGHT NOW. Having the potties nearby makes it easier for them to go quickly. You can also set a timer that plays a song or funny ringtone to remind them to take a “potty break.” Make it a game and have them race to the potty to see who can get their first. Do a quick shopping trip at a store or online. Do a trip where your twins pick out their own underpants with the characters or illustrations they love. 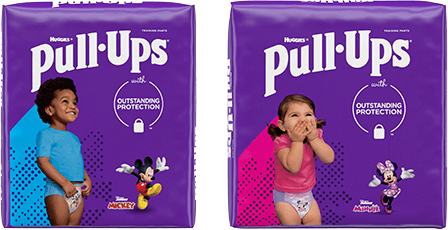 They can also pick out their own box of Pull-Ups® Training Pants with their favorite characters to keep stashed next to their potties so they can easily pull them on themselves after the bath and before bedtime. If your twins aren’t progressing at the same time don’t make rewards a big focus of the potty training process. Celebrate the twin who is successfully going to the potty by singing a special potty song, doing a potty dance or giving a big high five. You want to keep encouraging that twin, but not make the other twin feel bad. Soon enough the lagging twin will catch up. Keep a change of clothes for your twins in your diaper bag. Accidents happen, especially when you first venture outside with your twins in underpants. Don’t make a big deal if one or both of them has an accident, just clean it up and move on. When using a public restroom, try to get the handicap accessible stall so you can fit both kids in the stall with you and they can take turns on the toilet. The most important thing to keep in mind when potty training multiples is that it’s not a competition – they will each get there eventually. Let them go at their own paces, and do not make it a competition – these are keys to success while also keeping sibling rivalry to a minimum. Soon enough, you’ll be on to your next adventure in raising twins.